When dinner time comes around, the last thing any parent wants to be doing is standing over a hot stove. We would rather get dinner done and spend quality time with the children. A few nights ago, listening to the pitter-patter of the kids playing in the other room, I had four different pots on the stove and a dish in the oven. Two hours later, it was time for dinner and time to catch up with the children’s day. Sadly, that lasted a whole five minutes and I had to look forward to cleaning up the dishes. Enough was enough! I am a huge fan of one pot meals because they are so simple and easy. Plus the clean up literally takes only a few minutes compared to countless hours. We all have that one pan, that, at one point, was our favorite but it has been shoved back to no man’s land. Well, mine ended up being a trusty cast iron skillet that I have had since forever. It is the perfect pan to create a one dish meal in. In case you did not know, cast iron skillets are non sticking and actually healthy to cook in. Why did I not think of this sooner? I hope you enjoyed my Caprese Chicken Cast Iron Meal as much as my family does. If you make it, make sure to share with us on Facebook or Twitter! Also, check out all of our other Main Dish Recipes. Yum, I’ve made something similar in oven, I use basil pesto with it. Tastes so good. Yes, I think they are becoming more popular now. This sounds delicious, I love one pot meals too. I might have to invest in a cast iron pot after all. I don’t understand why they are supposed to be healthy though. Love this recipe; and the cast iron. I use mine all the time while camping. I love using my cast iron pan. This sounds like a great recipe to try out with it. I love using a cast iron pan. This would taste wonderful. This sounds really good. I’ll have to try this recipe. 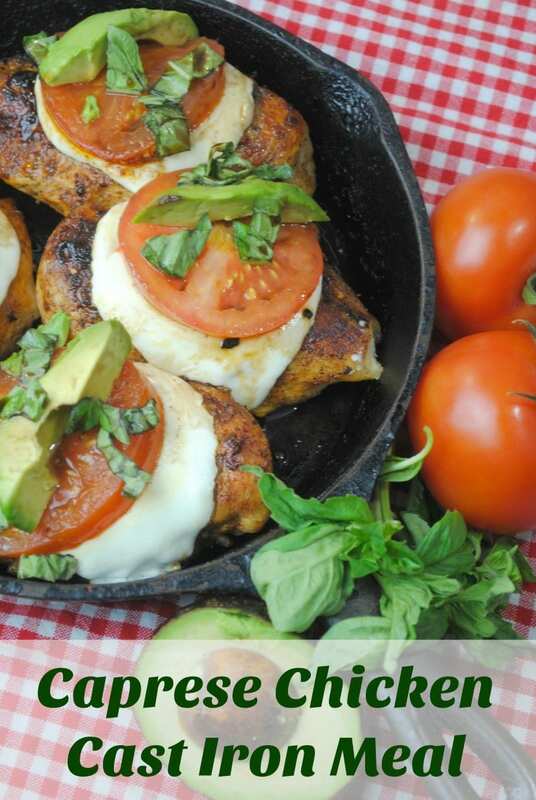 I love chicken and this sounds amazing.The ingredients are my favorites too. These look fabulous! I have a cast iron pan – never thought of using if for something like this before! Looks very easy, and delicious! Love cooking in cast iron! This sounds delicious and it’s nice that it’s cooked in a cast iron pan. Thank you for the recipe. This looks delicious and my daughter loves Italian seasoning and Italian Dressing on her chicken will be trying this!!! This sounds perfect now that tomatoes and basil are coming back into season again. Yum! This does sound like a tasty dish! I love cooking in grandma’s cast iron pots!